Gardiner BJ, Machado PRL, Ooi WW. 18 September 2016, posting date. Comorbidities in patients with Hansen's Disease. In Scollard DM, Gillis TP (ed), International textbook of leprosy. www.internationaltextbookofleprosy.org. Hansen’s disease (HD) is rare in the U.S., with approximately 200 new cases identified annually. The majority of these cases is seen in immigrants or travellers, but up to 20% of new cases each year is seen in persons from the Gulf Coast states who have never left the U.S. The World Health Organization’s (WHO) HD prevalence data recorded at the beginning of 2015 showed a rate of 0.31 per 10,000 population, which is marginally less than that of 2014 . The coexistence of other infectious comorbidities in patients with HD has been recognized for many decades , although the relationships often have been difficult to define. The nature and prevalence of the comorbidities are primarily influenced by the local epidemiology in the region of origin of the patient. These comorbidities may affect the development of clinical manifestations of HD or its reactional states, as well as cause confusion in their diagnosis. They also represent an underappreciated challenge in the treatment of HD, especially outside of endemic areas, when asymptomatic latent infections can reactivate when immunosuppressive therapy is given for HD. High-dose corticosteroid therapy given for ≥6 months is frequently used to treat acute neuritis  and type 1 or type 2 reactions (see Chapter 2.2)  in HD. For example, in one U.S.-based study , two-thirds of the patients were prescribed steroids, and 93% of these steroid courses were for more than 6 months. Occasionally, these inflammatory complications are treated with other immunosuppressive medications, such as tumor necrosis factor (TNF)-α inhibitors, methotrexate, or cyclosporine. Infections are well-recognized complications of these drugs outside of the HD setting (e.g., in transplantation and rheumatologic patients), where protocols for screening, prophylaxis, and monitoring of patients on these medications are well established . The most commonly identified comorbidities in HD seen worldwide are HIV (as discussed separately in Chapter 3.3), tuberculosis, hepatitis B, and strongyloidiasis, which form the focus of this chapter . Since Brazil, India, and Indonesia account for 81% of new cases globally, we also touch upon diseases endemic to these areas, including leishmaniasis, hepatitis C, human T-cell lymphotropic virus type 1 (HTLV-1), and intestinal helminths. While Chagas disease is also endemic in South America in regions where HD is prevalent and may present as a latent disease that can reactivate with immunosuppression, very limited published information is available on this interaction , . For this reason, further discussion is deferred in this chapter. Diabetes mellitus is increasing in prevalence worldwide and is the most commonly described non-infectious comorbidity in patients with HD. There are limited published data on many of these co-infections due to the challenges of studying the complex interaction between HD and these diseases, which often have long latent periods or asymptomatic carrier states. Tuberculosis (TB) and HD are diseases that share many similarities, as outlined in Table 1 . Both have plagued mankind for thousands of years  and have a poor prognosis in the absence of therapy, with high rates of morbidity and mortality. Both are chronic granulomatous infections caused by intracellular aerobic acid-fast bacilli that multiply slowly and have long incubation periods, resulting in chronic disease over many months to years. Both display a spectrum of clinical presentations dependent on the host Th1 response (see Figure 1; also see Chapter 6.3). As with many of the other diseases discussed in this chapter, the relationship between TB and HD is probably dependent on multiple factors, with poor nutritional status and poverty significant as confounding variables. However, there are still more than 200,000 new cases of HD and 9 million new cases of TB reported annually worldwide, despite ongoing improvements in treatment and living conditions in many countries. Host factors such as HIV, prednisolone use, and underlying genetic predisposition probably also influence the relationship . Genetic studies have suggested that it is likely that the two mycobacteria share a common ancestor . The M. leprae genome (see Chapter 8.1) has approximately 1600 genes, of which 90% are found in M. tuberculosis, which has 4000 genes . Despite this long history, their relationship remains poorly understood. There has long been a suggestion of cross-immunity between the two infections, but this claim remains unproven . Historical data have demonstrated a high incidence of concomitant infection, but co-infection with HD and active TB is reported less frequently now. The few recent publications that exist include uncomplicated cases  as well as cases associated with renal transplantation  and malnutrition . One possible explanation for this decline may be the influence and uptake of Bacillus Calmette-Guérin (BCG) vaccination in endemic areas, which provides at least partial protection against both diseases . In a retrospective study done in a dermatology clinic in Brazil between 2004 and 2011, Trinidade et al. described only two patients who were co-infected, despite high local endemicity rates: 30,000 new cases of HD and more than 70,000 new cases of TB in Brazil each year . One patient with mid-borderline (BB)–borderline (BT) leprosy showed a type 1 HD reaction during the first 3 months of treatment for pleural TB and, in the other BB-BT patient, pulmonary TB was diagnosed during the first 3 months of treatment for a type 1 HD reaction. Susceptibility to mycobacterial infections may be linked to cellular immune defects, but both patients showed normal cellular immune responses on testing, including in the interferon-gamma/interleukin-12 (IFN-γ/IL-12) axis, which drives effective Th1 responses. The reports on the interaction between the two mycobacteria are highly speculative. Some studies suggest that HD, especially the anergic form, would predispose to TB . Other investigations suggest an antagonism between the two diseases, i.e., that those individuals with acquired immunity to M. leprae may be less susceptible to pulmonary TB because of cross immunity . Genetic analyses (see Chapter 8.1) done to further define the basis of mycobacterial immunity have found an association of HLA-DR2 (or certain molecular subtypes) with pulmonary TB and susceptibility to polar forms of HD (tuberculoid leprosy [TT] and lepromatous leprosy [LL]) but not HD per se . This finding is consistent with human leukocyte antigen (HLA) playing a role in the relatively late stages of infection, with antigen-specific T-cell immunity governing the polarization of HD to tuberculoid or lepromatous forms. Although little is known about the molecular nature of HLA-restricted mycobacterial antigens, it has been suggested that certain HLA class II genes, by selecting certain sets of antigenic peptides and specific helper T cells, may contribute to the development of TB or polar HD . The frequent use of steroids in the treatment of leprotic reactions and neuritis may predispose a patient to the reactivation of latent TB. A diagnosis of latent TB can be particularly challenging in patients with HD, many of whom have a positive tuberculin skin test (TST), with rates not well known overall but at 15.4% in our study . 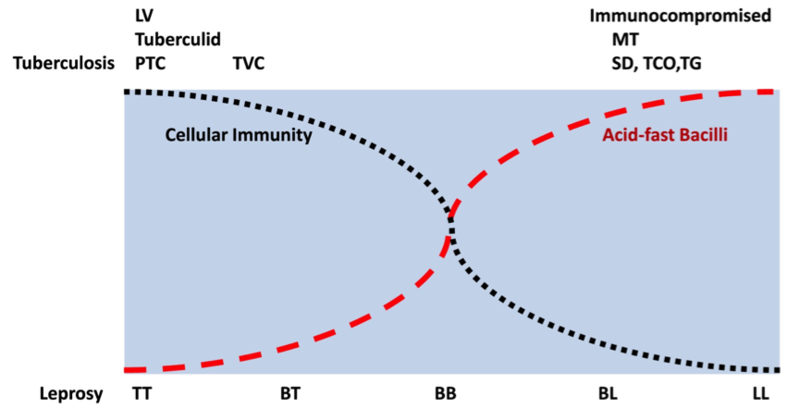 The BCG vaccine is widely used in areas endemic with HD, which can affect this observation (although the degree of induration produced by TST tends to wane 5 to 7 years after childhood BCG vaccine administration). The BCG vaccine clearly has a protective effect on the acquisition of HD, with a rate of protection demonstrated to be between 26–56% . Some HD patients have been noted to have ‘giant’ reactions of up to 13cm to purified protein derivative (PPD), despite having no evidence of infection with TB . The performance of the interferon-γ release assays (IGRA) has not been sufficiently validated for the diagnosis of latent TB in HD patients. False positive results have been seen with the Quantiferon Gold (QFG) assay, thought to be due to cross-reactivity between the TB antigens utilized in the test and HD antigens. False negative results also occur, possibly due to anergy—for example, in one recent study, negative QFG results were seen in all 40 multibacillary (MB) patients tested . Unfortunately, there was no control group in this study and the clinical stage of disease (treated vs. untreated, with reaction or without), which may have affected the QFG results, was not described. Based on the available evidence to date, the QFG test alone cannot be used to rule latent TB in or out in co-infected patients, and each patient should be judged on a case-by-case basis. Despite these diagnostic challenges, it is critical to screen and identify patients with underlying TB (active or latent) prior to the commencement of anti-lepromatous therapy, especially if daily rifampin is not included in the therapeutic regimen. While 600mg of rifampin daily (recommended for multi-drug therapy [MDT] in the U.S.; see Chapter 2.6) represents adequate therapy for latent TB, there is a risk that monotherapy could contribute to the development of drug resistance (see Chapter 5.2) in patients with undiagnosed active TB . If active TB is diagnosed after the commencement of HD treatment, susceptibility testing should be performed to confirm rifampin susceptibility, and empiric treatment regimens used should cover the possibility of rifampin resistance until susceptibility results are known . Further studies are needed to evaluate whether current WHO guidelines for monthly rifampin treatments in HD increase the risk of rifampin resistance in patients with undiagnosed active TB and, if so, whether this risk is higher or lower than in patients who receive rifampin daily. Hepatitis B virus (HBV) is a common comorbidity in patients with HD. The natural history of hepatitis B is determined by the interplay between the virus and the host immune system and consists of several phases—immune tolerance, immune clearance, inactive carrier state, and resolution. There has been long-standing speculation that the underlying immune defects seen in patients with LL HD may reduce the rates of immune clearance and resolution in hepatitis B , . Some studies have reported higher rates of chronic HBV infection in HD (especially LL) patients compared to healthy controls , while others have not identified significant differences . Thus, the exact nature of this relationship is still being elucidated . Many factors can influence the natural history of hepatitis B in patients with HD and rates of co-infection may be confounded by age, socioeconomic status, and exposure to healthcare institutions, including long-term institutionalization. While the institutionalization of HD patients with LL has been highly associated with HBV historically, more recent studies have found an association in outpatient populations . In many developing countries, routine hepatitis B vaccination and neonatal prophylaxis were not widespread until recently and, as such, there are high rates of chronic asymptomatic infection resulting from perinatal transmission among the adult population. In our clinic, 11% of 80 predominantly foreign-born patients tested positive for the hepatitis B surface antigen . While the liver is the most frequently affected visceral organ in MB HD, the clinical impact of viral hepatitis co-infections on the immunologically mediated reactions of HD (see Chapter 2.2) is not known. One study has documented a possible association between the hepatitis B or C infection and the development of reversal reactions . A cohort study conducted in Brazil on 245 HD outpatients showed a higher prevalence of HBV co-infection compared to controls, as well as an association of hepatitis B with a higher rate of neuritis and development of nerve function impairment . The major risk in patients co-infected with HBV and HD is HBV reactivation and progression to acute hepatic necrosis following the administration of prednisolone. This risk has been well characterized in patients undergoing treatment for cancer or autoimmune conditions . It is suggested that prior to the commencement of treatment, all patients newly diagnosed with HD should be tested for the hepatitis B surface antigen and surface antibody. Non-immune patients can be vaccinated if resources permit; post-vaccination surface antibody titers should be checked as vaccine response rates may be lower . Liver function tests should be regularly monitored in HBV co-infected patients, as HD treatment involves potentially hepatotoxic drugs such as rifampin. According to the American Gastroenterological Association (AGA) guidelines, hepatitis B surface antigen positive patients receiving >10–20mg prednisolone for more than four weeks are considered at high risk for developing an HBV flare and should receive an antiviral prophylaxis . Entecavir and tenofovir have surpassed lamivudine and adefovir as first-line therapy given their higher barrier to resistance and lower toxicity. The prophylaxis should be continued for at least six months beyond the cessation of steroid therapy, with close monitoring of the viral load afterwards to detect any ongoing flares. There are no reports of major drug interactions between anti-lepromatous medications and HBV antivirals. A higher prevalence of hepatitis C virus (HCV) has been associated with HD in several African countries and also in Yemen, Brazil, and Japan . HCV co-infection has also been found more frequently in institutionalized lepromatous patients . One possible explanation for this observation is the historical reuse of medical needles and syringes or other medical equipment without adequate sterilization within sanatoria . On the other hand, although a lower HCV co-infection rate has been described in a cohort of 245 HD outpatients, co-infected patients had higher rates of HD neuritis and nerve function impairment (see Chapter 2.5) . In HCV co-infected cases, whether the emergence of reactions may be due not only to a modification on the host immune response induced by the virus, but also as a consequence of the use of interferon-α for HCV treatment, needs to be further elucidated. HTLV-1 is a retrovirus endemic in several regions of the world, where it is the agent of adult T-cell leukemia/lymphoma, HTLV-1-associated myelopathy/tropical spastic paraparesis (HAM/TSP), and infective dermatitis . It preferentially infects CD4+ T-cells and induces a spontaneous production of inflammatory cytokines like TNF-α and IFN-γ, as well as some Th2 cytokines . Therefore, HTLV-1 co-infection may modify the host immune response, driving inflammation or immunosuppression. A higher seroprevalence of HTLV-1 in HD subjects has been described in Japan , Ivory Coast, and Congo , but no association with the HD spectrum or any specific clinical complications like reactions or neuritis was identified. A survival study in Congo showed that the HTLV-1 co-infection was associated with an unexplained and increased mortality rate among HD inpatients . More recently, a prospective study in Brazil found a higher seroprevalence of this virus in HD patients, and HTLV-1 co-infected patients were at a higher risk of developing nerve function impairment, including silent neuritis. One out of six HD co-infected subjects relapsed . While these associations between HTLV-1 and HD are unexplained, we suggest that patients with HD from areas endemic for both agents (such as the Caribbean and South America) be screened for HTLV-1. This screening is particularly important in patients who are antibody positive for strongyloidiasis, given the association of HTLV-1 with strongyloides hyperinfection syndrome. Strongyloides stercoralis is a ubiquitous nematode found commonly in tropical and subtropical areas. It is usually acquired when filariform larvae in the soil penetrate intact skin . Its life cycle is more complex than most nematodes in that it is able to auto-infect, multiply, and persist within the same host. This cycle explains its presence in some people decades after leaving endemic areas. Most patients in this chronic stage of infection have no or mild non-specific abdominal symptoms. Diagnosis can be made by the identification of rhabditiform (or occasionally filariform) larvae in the stool; however, serum antibody testing is more sensitive and less labor-intensive, so it is the recommended approach for screening for chronic strongyloidiasis . Disseminated disease is well described in patients receiving systemic steroid therapy and is preventable by screening and treatment prior to the commencement of immunosuppression. Ivermectin (200 μg/kg orally for 2 doses on consecutive days) is recommended as the first-line therapy; oral albendazole (400mg twice daily for 7 days) is an alternative . Antibody titers generally decrease within six months after successful treatment . A delayed diagnosis can result in poor outcomes including hyperinfection syndrome and death . There are different approaches to dealing with this common co-infection in different geographic centers worldwide. Indian HD manuals consider the S. stercoralis infection to be a relative contraindication to steroid therapy. In Cambodia, the National HD Program recommends the administration of empiric albendazole therapy before the initiation of corticosteroids. In Brazil, there are no national guidelines, but in subjects for whom stool testing is not performed, anti-helminthics are generally prescribed prior to immunosuppressive therapy. In the U.S., there are no guidelines in the federal HD program specifically addressing this issue. Our clinic (with a seroprevalence rate of 45%) routinely obtains a strongyloides antibody titer on all patients prior to their treatment; all patients with a positive test are treated with ivermectin and their titers are assessed until negative. It is known that helminthic infections drive the immune response toward a Th2 profile, inducing IL-10 production and the proliferation of regulatory T-cells leading to downregulation of Th1 responses. There is some evidence that a Th1 downregulation by helminthic co-infection may be associated with the clinical presentation of HD, which is dependent upon an effective Th1 immune response. Firstly, there is a higher frequency of lepromatous disease described in subjects living in a region hyperendemic for onchocerciasis in West Africa . Secondly, there is a significant association between intestinal helminthic co-infection (Ascaris lumbricoides and Trichuris trichiura) and lepromatous HD, as well as a correlation between the frequency of nematodes and the positivity of the bacillary index in HD subjects from Brazil . Furthermore, patients with intestinal nematodes have a higher prevalence of MB disease and decreased levels of interferon-γ when compared to HD subjects without a helminthic infection . Taken together, these data indicate that the presence of worms may interfere with the course of HD, favoring the development of MB disease. In addition, unpublished data from Brazil suggest that HD patients co-infected with nematodes do not have a higher propensity for developing reactions, but when they do occur, the patients develop Type 2 reactions more often than Type 1 (Machado et al., unpublished). HD and tegumentary leishmaniasis have several features in common: they are both caused by intracellular parasites and they have similar spectral, clinical, and histopathological manifestations that are driven by the host immune response. The similarities between them can lead to diagnostic confusion. The confusion occurs mainly with respect to diffuse cutaneous leishmaniasis and lepromatous HD that share infiltrated nodules and plaques with a heavy parasitological load due to their species-specific anergy. Conversely, a classical cutaneous leishmaniasis lesion in a subject with preserved cellular immunity against Leishmania is characterized by a typical round ulcer with raised borders on exposed body areas. Usually, this condition is easily distinguished clinically from tuberculoid HD (which represents the high cellular immune pole), where lesions are not ulcerated but rather well-defined anesthetic patches in any region of the body. Some examples are shown in Figure 2. Even in regions endemic for both diseases, the documentation of co-infected subjects is uncommon. The largest series of cases was described by Barnetson and Bryceson in 1978 and included eight subjects from Ethiopia . Interestingly, these patients presented with different immunologically based forms of leishmaniasis and HD. For example, borderline lepromatous (BL) HD could be associated with either localized leishmaniasis (demonstrating a preserved Th1 profile and cellular immunity against Leishmania) or anergic diffuse leishmaniasis (showing a complete absence of a Th1 profile and cellular immunity to Leishmania antigens). Reports of concomitant mucocutaneous leishmaniasis (associated with a strong cellular and inflammatory anti-Leishmania immune response) and lepromatous HD , as well as post-kala-azar dermal leishmaniasis (cellular anergy) and BT HD , illustrate that the cellular immune responses against M. leprae and Leishmania are quite species specific and may differ in degree in the same host. Nevertheless, due to the long incubation period of HD, it is possible that the host immune response triggered by M. leprae antigens may interfere with leishmanial immunopathogenesis. As documented in a patient with lepromatous HD, IL-10 production may have induced a regulatory response that contributed to the control of tissue damage by decreasing TNF-α of the concomitant mucosal leishmaniasis . Accordingly, it is known that the in vitro addition of IL-10 decreases the high TNF-α production by the peripheral blood mononuclear cells from mucosal leishmaniasis subjects . HD co-infection with kala-azar is even more rarely reported, despite high endemicity rates of both diseases in India and Nepal . Therefore, while clinicians working in regions where both diseases are endemic should be alert to the possibility of co-infection, limited data indicates that, in most cases, these two diseases have independent clinical outcomes with specific treatment. We recommend that the treatment of leishmaniasis should be initiated first due to its shorter duration so as to avoid the emergence of HD reactions during MDT in the presence of active leishmaniasis. Diabetes mellitus (DM) is an increasingly common problem in both developed and developing countries, driven at least partly by dietary changes and the global obesity epidemic. One case-control study identified diabetes in 13.3% of 30 HD patients compared to none in 15 age-matched controls; the use of prednisone was not discussed . Genetic factors may play a role. For example, PARK2 gene mutations have been associated with a predisposition to the development of HD  as well as type 2 diabetes and Parkinson’s disease . Although the long-term sequelae of diabetic neuropathy and Hansen’s neuropathy are similar, their clinical presentations are usually easily distinguishable. Specifically, neuropathy due to tuberculoid disease is unilateral and in a truncal nerve distribution as opposed to diabetic neuropathy, which is usually bilateral, most commonly in the feet in a ‘stocking’ distribution. In diffuse lepromatous disease where bilateral symmetrical neuropathy is typically found, clear-cut cutaneous lesions are usually recognizable. Despite these distinguishing features, there have been cases of delayed diagnoses of HD and, as such, it is important to consider the diagnosis of HD in any patient from an endemic area presenting with neuropathy, even if diabetes is present . Screening for steroid-induced DM should be part of the evaluation of patients on prednisolone therapy for HD reactions or neuritis. Known risk factors such as family history, older age, obesity, and history of gestational diabetes are important. Papang et al. prospectively evaluated 81 patients with no history of diabetes and normal blood glucose measurements and found that 19 (23.5%) developed steroid-induced DM during the treatment of their reactions . In one large study outside of the leprosy setting, patients receiving >30mg/day of prednisone had roughly ten times the odds of developing diabetes requiring the initiation of oral hypoglycemic agents compared to those not receiving prednisone . Rifampin interacts with many drugs via the cytochrome P450 system and can decrease levels of some sulfonylurea drugs (e.g., glyburide)  and pioglitazone . This drug interaction could affect glycemic control or risk hypoglycemia following rifampin cessation. Blood glucose levels should be closely monitored in these patients and adjustments made as required on an individualized basis. There appears to be no significant interaction with metformin. HD is rare in most countries in the 21st century; however, pockets of endemicity still exist. Most cases occur in individuals living in or migrating from India, Brazil, and a handful of other regions. A diagnosis of HD may suggest potential exposure to other endemic infections from these areas, the most common of which we have described above. Like M. leprae, many of these are also intracellular pathogens, whose clinical presentations are dependent on the host Th1 response. They appear to occur more commonly with lepromatous HD than other forms of this disease. The published literature on many of these co-infections is sparse, and in most cases the actual risk to an individual patient can only be determined by a thorough clinical assessment. As such, we recommend that newly diagnosed HD patients be evaluated in a systematized yet individualized fashion, taking into account region of origin, other epidemiologic risk factors, prior exposures, etc. A suggested approach is outlined in Table 2. In patients commencing steroid therapy for reactions or neuritis, a higher index of suspicion needs to be maintained for occult infections that can reactivate and result in complications such as tuberculosis, Hepatitis B, and strongyloidiasis. Testing and/or empiric therapy for these infections may be warranted. We look forward to future studies clarifying the prevalence, optimal diagnosis and treatment, and interactions between HD and these varied co-infections. TABLE 2 Suggested approach for screening patients with newly diagnosed HD for comorbidities/co-infections. TB, Hepatitis B, Hepatitis C and HIV should be screened for in all patients. ^ 2015. Global leprosy update, 2014: need for early case detection. Wkly Epidemiol Rec 90:461–474. ^ Singh M, Kaur S, Kumar B, Kaur I, Sharma VK. 1987. The associated diseases with leprosy. Indian J Lepr 59:315–321. ^ van Veen NH, Nicholls PG, Smith WC, Richardus JH. 2008. Corticosteroids for treating nerve damage in leprosy. A Cochrane review. Lepr Rev 79:361–371. a, b, c, d Bilodeau M, Burns S, Gawoski J, Moschella S, Ooi W. 2013. Co-morbid infections in Hansen’s disease patients in the United States: considerations for treatment. Am J Trop Med Hyg 89:781–783. ^ Fishman JA. 2007. Infection in solid-organ transplant recipients. N Engl J Med 357:2601–2614. ^ Paige CF, Scholl DT, Truman RW. 2002. Prevalence and incidence density of Mycobacterium leprae and Trypanosoma cruzi infections within a population of wild nine-banded armadillos. Am J Trop Med Hyg 67:528–532. ^ Trindade MA, Carvalho NB, Belfort EC, Pagliari C, Gakiya E, Sakai-Valente NY, Benard G, Shikanai-Yasuda MA. 2011. A patient with erythema nodosus leprosum and Chagas cardiopathy: challenges in patient management and review of the literature. Am J Trop Med Hyg 84:973–977. ^ Scollard DM, Dacso MM, Abad-Venida ML. 2015. Tuberculosis and leprosy: classical granulomatous diseases in the twenty-first century. Dermatol Clin 33:541–562. ^ Donoghue HD, Marcsik A, Matheson C, Vernon K, Nuorala E, Molto JE, Greenblatt CL, Spigelman M. 2005. Co-infection of Mycobacterium tuberculosis and Mycobacterium leprae in human archaeological samples: a possible explanation for the historical decline of leprosy. Proceedings. Biological sciences / The Royal Society 272:389–394. ^ Loh E, Maverakis E, Konia T, Noll E. 2012. Lepromatous leprosy in a 26-year-old man with concurrent disseminated tuberculosis. Arch Dermatol 148:1096–1097. ^ Gomez-Valero L, Rocha EP, Latorre A, Silva FJ. 2007. Reconstructing the ancestor of Mycobacterium leprae: the dynamics of gene loss and genome reduction. Genome Res 17:1178–1185. a, b Rawson TM, Anjum V, Hodgson J, Rao AK, Murthy K, Rao PS, Subbanna J, Rao PV. 2014. Leprosy and tuberculosis concomitant infection: a poorly understood, age-old relationship. Lepr Rev 85:288–295. a, b Trindade MA, Miyamoto D, Benard G, Sakai-Valente NY, Vasconcelos Dde M, Naafs B. 2013. Leprosy and tuberculosis co-infection: clinical and immunological report of two cases and review of the literature. Am J Trop Med Hyg 88:236–240. ^ Agarwal DK, Mehta AR, Sharma AP, Sural S, Kumar A, Mehta B, Gupta A, Sharma RK, Gupta RK. 2000. Coinfection with leprosy and tuberculosis in a renal transplant recipient. Nephrol Dial Transplant 15:1720–1721. ^ Saha K, Rao KN. 1989. Undernutrition in lepromatous leprosy. V. Severe nutritional deficit in lepromatous patients co-infected with pulmonary tuberculosis. Eur J Clin Nutr 43:117–128. ^ Merle CS, Cunha SS, Rodrigues LC. 2010. BCG vaccination and leprosy protection: review of current evidence and status of BCG in leprosy control. Expert Rev Vaccines 9:209–222. ^ Premanath M, Ramu G. 1976. The association of leprosy and tuberculosis. J Indian Med Assoc 67:143–145. ^ Chaussinand R. 1948. Tuberculosis and leprosy, antagonist diseases. Prevention of leprosy by tuberculosis. Int J Lepr 16:431–438. ^ Mehra NK, Rajalingam R, Mitra DK, Taneja V, Giphart MJ. 1995. Variants of HLA-DR2/DR51 group haplotypes and susceptibility to tuberculoid leprosy and pulmonary tuberculosis in Asian Indians. Int J Lepr Other Mycobact Dis 63:241–248. ^ Singh M, Balamurugan A, Katoch K, Sharma SK, Mehra NK. 2007. Immunogenetics of mycobacterial infections in the North Indian population. Tissue Antigens 69(Suppl 1):228–230. ^ Murthy V, Horowitz HW, Pham VP, Levis WR. 2012. Giant PPD reaction with positive QuantiFERON-TB Gold in a patient with lepromatous leprosy. J Drugs Dermatol 11:1151–1152. ^ Rendini T, Levis W. 2015. Quantiferon-Gold TB cannot detect latent TB in patients with leprosy. Clin Infect Dis 61(9):1439–1440. ^ Getahun H, Matteelli A, Chaisson RE, Raviglione M. 2015. Latent Mycobacterium tuberculosis infection. N Engl J Med 372:2127–2135. ^ Nigam PK, Gupta GB, Khare A. 2003. Hepatic involvement and hepatitis B surface antigen (Hbs Ag) in leprosy. Indian J Dermotol Venereol Leprol 69:32–34. ^ Yvonnet B, Vincelot P, Millan J, Lesage G, Denis F, Languillon J, Mboup S, Coursaget P, Diop Mar I, Chiron JP. 1989. Hepatitis B virus infection in lepromatous and tuberculoid patients from Senegal. Acta Leprol 7:63–66. a, b Leitao C, Ueda D, de Moraes Braga AC, Boldt AB, Messias-Reason IJ. 2014. Leprosy and hepatitis B coinfection in southern Brazil. Braz J Infect Dis 18:8–12. ^ Brown AE, Nelson KE, Smith TC, Suprasert S, Scollard DM. 1989. Hepatitis B antigen and antibody in patients with leprosy: a study of three resettlement villages in Thailand. Asian Pac J Allergy Immunol 7:89–93. ^ Ramos JM, Costa e Silva AM, Martins RM, Souto FJ. 2011. Prevalence of hepatitis B and C virus infection among leprosy patients in a leprosy-endemic region of central Brazil. Mem Inst Oswaldo Cruz 106:632–634. ^ Rego VP, Machado PR, Martins I, Trindade R, Parana R. 2007. Type 1 reaction in leprosy: characteristics and association with hepatitis B and C viruses. Rev Soc Bras Med Trop 40:546–549. a, b, c Machado PR, Machado LM, Shibuya M, Rego J, Johnson WD, Glesby MJ. 2015. Viral co-infection and leprosy outcomes: a cohort study. PLoS Negl Trop Dis 9:e0003865. ^ Wang HS, Han SH. 2010. Management of hepatitis B in special patient populations. Clin Liver Dis 14:505–520. ^ Rosa H, Pedrosa S, Cardoso DD. 1994. Hepatitis B vaccination in leprosy patients. Mem Inst Oswaldo Cruz 89:377–378. ^ Reddy KR, Beavers KL, Hammond SP, Lim JK, Falck-Ytter YT, American Gastroenterological Association I. 2015. American Gastroenterological Association Institute guideline on the prevention and treatment of hepatitis B virus reactivation during immunosuppressive drug therapy. Gastroenterology 148:215–219. ^ Machado PR, Johnson WD, Glesby MJ. 2012. The role of human T cell lymphotrophic virus type 1, hepatitis B virus and hepatitis C virus coinfections in leprosy. Mem Inst Oswaldo Cruz 107(Suppl 1):43–48. ^ de Moraes Braga AC, Reason IJ, Maluf EC, Vieira ER. 2006. Leprosy and confinement due to leprosy show high association with hepatitis C in Southern Brazil. Acta tropica 97:88–93. ^ Shiogama K, Teramoto H, Morita Y, Mizutani Y, Shimomura R, Inada K, Kamahora T, Makino M, Tsutsumi Y. 2010. Hepatitis C virus infection in a Japanese leprosy sanatorium for the past 67 years. J Med Virol 82:556–561. ^ Marsh BJ. 1996. Infectious complications of human T cell leukemia/lymphoma virus type I infection. Clin Infect Dis 23:138–145. ^ Carvalho EM, Bacellar O, Porto AF, Braga S, Galvao-Castro B, Neva F. 2001. Cytokine profile and immunomodulation in asymptomatic human T-lymphotropic virus type 1-infected blood donors. J Acquir Immune Defic Syndr 27:1–6. ^ Hanada S, Uematsu T, Iwahashi M, Nomura K, Utsunomiya A, Kodama M, Ishibashi K, Terada A, Saito T, Makino T, et al. 1989. The prevalence of human T-cell leukemia virus type I infection in patients with hematologic and nonhematologic diseases in an adult T-cell leukemia-endemic area of Japan. Cancer 64:1290–1295. ^ Verdier M, Denis F, Sangare A, Leonard G, Sassou-Guesseau E, Gaye A, al-Qubati Y, Rey JL, N’Gaporo I, Doua F, et al. 1990. Antibodies to human T lymphotropic virus type 1 in patients with leprosy in tropical areas. J Infect Dis 161:1309–1310. ^ Lechat MF, Shrager DI, Declercq E, Bertrand F, Blattner WA, Blumberg BS. 1997. Decreased survival of HTLV-I carriers in leprosy patients from the Democratic Republic of the Congo: a historical prospective study. J Acquir Immune Defic Syndr 15:387–390. ^ Segarra-Newnham M. 2007. Manifestations, diagnosis, and treatment of Strongyloides stercoralis infection. Ann Pharmacother 41:1992–2001. ^ Pelletier LL, Jr., Baker CB, Gam AA, Nutman TB, Neva FA. 1988. Diagnosis and evaluation of treatment of chronic strongyloidiasis in ex-prisoners of war. J Infect Dis 157:573–576. ^ Greaves D, Coggle S, Pollard C, Aliyu SH, Moore EM. 2013. Strongyloides stercoralis infection. BMJ 347:f4610. ^ Loutfy MR, Wilson M, Keystone JS, Kain KC. 2002. Serology and eosinophil count in the diagnosis and management of strongyloidiasis in a non-endemic area. Am J Trop Med Hyg 66:749–752. ^ Leang B, Lynen L, Tootill R, Griffiths S, Monchy D. 2004. Death caused by strongyloides hyperinfection in a leprosy patient on treatment for a type II leprosy reaction. Lepr Rev 75:398–403. ^ Prost A, Nebout M, Rougemont A. 1979. Lepromatous leprosy and onchocerciasis. Br Med J 1:589–590. ^ Diniz LM, Zandonade E, Dietze R, Pereira FE, Ribeiro-Rodrigues R. 2001. Short report: do intestinal nematodes increase the risk for multibacillary leprosy? Am J Trop Med Hyg 65:852–854. ^ Barnetson RS, Bryceson AD. 1978. Cutaneous leishmaniasis and leprosy. Trans R Soc Trop Med Hyg 72:160–163. ^ Matos DS, Azeredo-Coutinho RB, Schubach A, Conceicao-Silva F, Baptista C, Moreira JS, Mendonca SC. 2005. Differential interferon-gamma production characterizes the cytokine responses to Leishmania and Mycobacterium leprae antigens in concomitant mucocutaneous leishmaniasis and lepromatous leprosy. Clin Infect Dis 40:e5–12. ^ Bansal S, Goel A, Sardana K, Kumar V, Khurana N. 2007. Postkala-azar dermal leishmaniasis coexisting with borderline tuberculoid leprosy. Br J Dermatol 157:811–813. ^ Azeredo-Coutinho RB, Matos DC, Nery JA, Valete-Rosalino CM, Mendonca SC. 2012. Interleukin-10-dependent down-regulation of interferon-gamma response to Leishmania by Mycobacterium leprae antigens during the clinical course of a coinfection. Braz J Med Biol Res 45:632–636. ^ Bacellar O, Lessa H, Schriefer A, Machado P, Ribeiro de Jesus A, Dutra WO, Gollob KJ, Carvalho EM. 2002. Up-regulation of Th1-type responses in mucosal leishmaniasis patients. Infect Immun 70:6734–6740. ^ Rijal A, Rijal S, Bhandari S. 2009. Leprosy coinfection with kala-azar. Int J Dermatol 48:740–742. ^ La Cognata V, Iemmolo R, D’Agata V, Scuderi S, Drago F, Zappia M, Cavallaro S. 2014. Increasing the coding potential of genomes through alternative splicing: the case of PARK2 gene. Curr Genomics 15:203–216. ^ Rawson TM, Anjum V. 2014. Leprosy interpreted as diabetes related complications. Indian J Lepr 86:65–67. ^ Papang R, John AS, Abraham S, Rao PS. 2009. A study of steroid-induced diabetes mellitus in leprosy. Indian J Lepr 81:125–129. ^ Gurwitz JH, Bohn RL, Glynn RJ, Monane M, Mogun H, Avorn J. 1994. Glucocorticoids and the risk for initiation of hypoglycemic therapy. Arch Intern Med 154:97–101. ^ Niemi M, Backman JT, Neuvonen M, Neuvonen PJ, Kivisto KT. 2001. Effects of rifampin on the pharmacokinetics and pharmacodynamics of glyburide and glipizide. Clin Pharmacol Ther 69:400–406. ^ Jaakkola T, Backman JT, Neuvonen M, Laitila J, Neuvonen PJ. 2006. Effect of rifampin on the pharmacokinetics of pioglitazone. Br J Clin Pharmacol 61:70–78.